248 other birds have this item in their bag or wishlist! The Ladies Upturn Noosa Hat from Kooringal is the stayer of the hat world - loyal and true. I really love this hat! I wear it at work and on the weekends. Love the colour, quality and fit of this hat. Will be perfect to fold and p[ack for my next holiday. 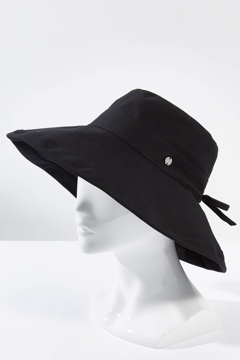 I bought this for travel and also as I wanted a hat that I could stash in my handbag as I am outdoors a bit for work. This was good for both - it recovers well from being scrunched up. Not very good in wind though - as it is so soft the brim collapses with wind pressure. A nice thick, good quality hat, but was too tight around the brim and I have returned. Excellent coverage for shade. Love the colour. I bought this hat in 3 different colours as they have a nice wide brim, fit into my carry bag and are easily washed. Perfect for playground duty! I love the adjustable brim and also the drawstring allowing me to tighten the fit according to wind - so versatile. At my local chemist they charged me $29.95. I have lots of colours. I've reordered the navy because it faded BUT I wear it to work everyday. So my NEW one is for show. LOVE THESE !!!!!! because "MY OLD" ...... Sorry I missed a couple of words. This is a great hat. I have a small head and really struggle to find hats that fit. The drawstring works perfectly, making the hat comfortable and a great fit. I also love that the hat can be folded for travel and its wide brim for good sun protection. Very stylish hat and has a great shade brim. Will get a lot of wear from this hat. Love it. Hi, I was looking for a hat for travelling. This will be perfect, easy to pack, practical colour and great fit! Thanks again Birdsnest girls! I love this hat.Its perfect to take on holidays as it folds up.It has a wide brim which is ideal to keep sun off my face.It has a drawstring so you can adjust the fit.I purchased with long black tank dress & I'm thrilled with the look. I needed a hat for travel, which would go with everything. This is a great option for folding up into your bag. Springs back like new. I have trouble finding hats to fit, as I have a large head. I think this was about 28 cms as opposed to the more common 27. Still quite a firm fit, but at least it is not uncomfortable, and will stay on in a breeze! For ladies with a normal size skull, the tie you can see at the back can be pulled in for a better fit. This hat's flexibility makes it the perfect hat for the hot summer. So happy with it. Thanks! I have been looking for a soft easy to pack and wear hat,that still looks good when i unpack it.I have found just what I want,thanks to the birds nest girls. I am extremely happy with all of my purchases.